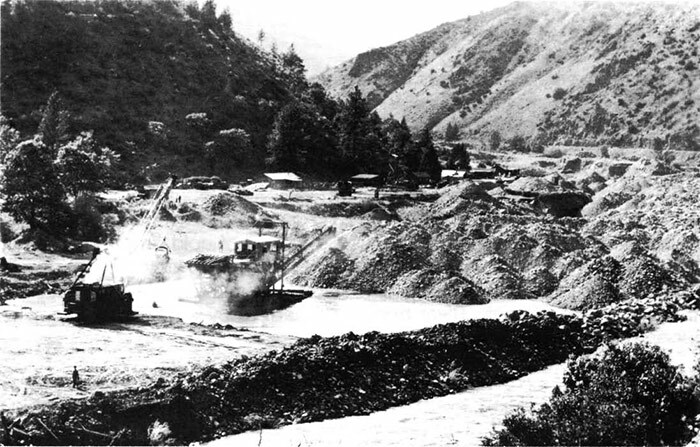 Beginning in the mid-1800s, mining, logging, farming, fishing, and dam construction all led to degradation of the Klamath River Basin ecosystem. Restoration efforts began in the 1970s, including increased streamflow and watershed rehabilitation. 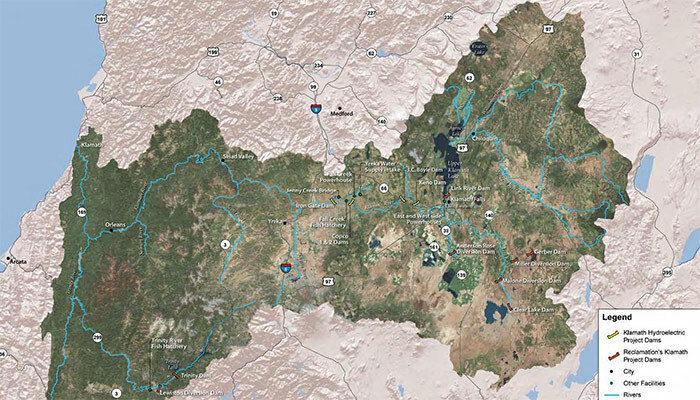 This story describes three restoration efforts—the Trinity River Restoration Program in the lower basin, the Conservation Area Fishery Restoration Program in the middle basin, and the Klamath Settlement Agreements in the upper basin. The emphasis is on "process," i.e., organization, planning, and implementation. Restoration efforts in the lower and middle basins overcame stakeholder conflicts and were generally successful. However, in the upper basin, legal battles between farmers and ranchers, fishermen, Native Americans, and government agencies prevented cooperation and restoration. Beginning in 2005 with a dialogue between Native Americans and farmers, the stakeholders finally organized to create a restoration plan. The Klamath Basin Restoration Agreement includes a water use program that reduces irrigation withdrawals, a riparian restoration program, and a fish reintroduction program. The Klamath Hydroelectric Settlement Agreement calls for the removal of four dams, the largest dam removal project in U.S. history. Under the Upper Klamath Basin Comprehensive Agreement, ranchers also agreed to use less water. Only the dam removal plan is being implemented, but one of the significant lessons from this story is how these game-changing agreements were achieved. The Klamath River is the third largest river, and the third largest producer of salmon on the Pacific coast, after the Columbia and Sacramento Rivers. 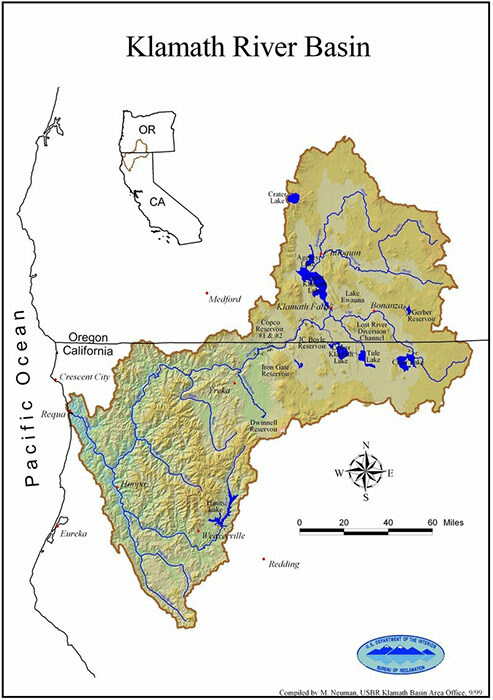 The river has a complex system of tributaries, and the watershed covers about 10 million acres in southern Oregon and northern California (see Figure 1). 6.1 million acres is public land and 3.8 million private. Annual rainfall ranges from 15 inches in the upper basin to 80 inches near the coast. Unlike most rivers, the Klamath begins on relatively flat land in high-elevation lakes and marshes (mainly Upper Klamath Lake). It then descends into a steep river canyon. 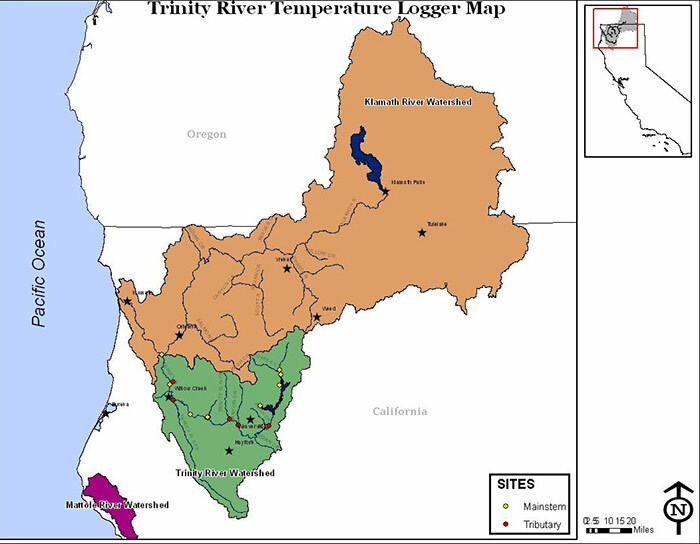 The river receives groundwater inflows in the upper basin and inflows from four tributaries—the Shasta, Scott, Salmon, and Trinity Rivers—in the lower basin (DOI 2013, EPA n.d., NRCS 2007). Europeans began arriving in the early 1800s, primarily as explorers and trappers. The California Gold Rush of the 1850s caused extreme degradation in the Trinity River, the Klamath's largest tributary, especially because of hydraulic mining and dredging methods (Figure 2) (Dunklin 2013). Logging throughout the middle and lower Klamath basin began in the late 1800s and caused sedimentation, landslides, and log jams in the river (KRBFTF 1991). The Indian tribes lost much of their lands, but never relinquished their rights to hunt, fish, and gather. Maintenance of fishery resources is one of the federal government's trust obligations (Klamath Tribes n.d., DOI 2000, KFMC 1992). The Interior Secretary's 1905 authorization provided for project works to drain and reclaim lake bed lands of the Lower Klamath and Tule Lakes, to store waters of the Klamath and Lost Rivers, to divert irrigation supplies, and to control flooding of the reclaimed lands. The states of Oregon and California ceded then-submerged land to the federal government for the specific purpose of having the land drained and reclaimed for irrigation use by homesteaders. The Oregon Legislature also authorized the raising and lowering of Upper Klamath Lake in connection with the Project, and allowed the use of the bed of Upper Klamath Lake for storage of water for irrigation. The Bureau of Reclamation constructed seven dams and over 700 miles of water channels to irrigate 210,000 acres of land with about 450,000 acre-feet of water per year (1 acre-foot = 43,560 cubic feet) ("Klamath Project" n.d., Keppen 2004, BOR 2009). Around the same time that the Bureau of Reclamation started building irrigation dams in the headwaters, the California-Oregon Power Company (Copco, now known as PacifiCorp) started building hydroelectric dams further downstream. Between 1903 and 1962, seven hydroelectric developments and one non-generating dam were built (pacificorp.com). The dams deny anadromous fish access to over 350 miles of historic spawning habitat, and for nearly 100 years, the Klamath Tribes above Iron Gate Dam have not had access to salmon (DOI 2013). Copco had promised to take any necessary measures to ensure fish passage, but did not do so. Instead, a hatchery was built to mitigate for the loss of salmon habitat (Klamath-Salmon Media 2007b, Boyle n.d.). A water quality problem also developed: "Each summer algae blooms turn water in the four reservoirs a fluorescent green, so toxic that human contact is forbidden, sometimes from the dams all the way downstream 190 miles to the river's mouth" (Leslie 2014). The algae also forms habitat for the intermediate host for salmon pathogens (FERC 2006). In 1963 two additional Bureau of Reclamation dams, Trinity and Lewiston, were completed on the Trinity River for both irrigation and hydroelectricity. They diverted nearly 1,000,000 acre-feet—75%-90% of the Trinity River's flow—out of the Klamath basin to the Central Valley Project, which irrigates about 3,000,000 acres of land. At the time, it was thought that this was "surplus" water and the fishery only needed 120,500 acre-feet of water per year. Besides diminishing streamflow, the dams blocked access to 109 miles of spawning and rearing habitat for salmon and other anadromous fish. The Trinity River Hatchery was built near Lewiston Dam to mitigate the loss (TRRP n.d.1, Dunklin 2013, DOI 2000, USFWS and HVT 1999). Figure 3 shows the location of Bureau of Reclamation dams and Copco dams. Besides mining, logging, and dams, the fish were also affected by the growth of commercial fishing, which intensified with the development of canning technology and increasingly sophisticated harvesting techniques. Chum salmon and pink salmon are now extinct in the Klamath, and all other species are at a fraction of their pre-European numbers. Two species of sucker fish, green sturgeon, coho salmon, and candlefish are on the endangered species list (Leslie 2014, Klamath-Salmon Media 2007b, NMFS and FWS 2013). Thus the Klamath Basin ecosystem became degraded and its water became "overappropriated." Competing demands led to bitter conflicts. In 1975 the Oregon Water Resources Department took up the Klamath River Basin Adjudication to determine relative rights to the use of surface water vested before 1909, when Oregon's Water Code was adopted, and rights that arose from the federal government's authority to reserve the use of water as an element of a reservation of federal or tribal land. There were 730 claims and 5,660 contests to those claims (Sheets 2011b). Besides the Adjudication, hundreds of lawsuits were filed in the courts, involving Indian tribes, farmers, ranchers, fishermen, environmentalists, and government agencies. The Trinity River is the Klamath River's largest tributary. Its watershed comprises about one fourth of the Klamath River Basin (see Figure 4). Although the Trinity dams are the most recently constructed Bureau of Reclamation dams in the Klamath River Basin, restoration efforts began in this watershed. As mentioned above, most of the Trinity's water was diverted out of the basin to the Central Valley Project beginning in 1963. Legislation authorizing the Trinity River dams specifically directed the U.S. Secretary of the Interior to ensure the preservation and propagation of fish and wildlife, and it quickly became clear that a streamflow of 120,500 acre-feet per year was not sufficient. According to the Bureau of Land Management (BLM 1995), "An immediate decline in the anadromous fish resource was detected, along with changes in channel morphology." Besides the obvious reduction of water available for fish to live in, silt and sand in the river was no longer flushed out, and major spawning areas below Lewiston Dam became covered with sediment; resting pools were filled in; and food producing areas (aquatic insect production) became smothered and unproductive (Denton 1982). These agencies became the first six members of the Trinity River Basin Fish and Wildlife Task Force. As soon as the proposal was completed, it was submitted to Congressman "Biz" Johnson in the hopes he could obtain authorization and funding. It worked. In late 1975, funds totaling about $7.5 million were made available for interim restoration work, and to develop a long-range Management Program. Interim work included instream flow needs studies and sand removal, in addition to long-term planning. Without more water, the efforts had little effect. In 1980, the U.S. Fish & Wildlife Service reported that chinook runs had decreased by 80% and steelhead by 60%. The Secretary of the Interior increased minimum releases from Lewiston Dam from 120,500 to 287,000 acre-feet per year. He also directed the Fish & Wildlife Service to commence a 12-year Flow Evaluation Study that would assess the effectiveness of flow and habitat restoration efforts and make recommendations. Four annual flow volumes were to be evaluated: 140,000, 220,000, 287,000, and 340,000 acre-feet. Data collected over the next 10 years prompted the Secretary to set a 340,000 acre-feet minimum release (Denton 1982, TRRP n.d.1, DOI 2000, USFWS and HVT 1999). In Congress, the Trinity River Stream Rectification Act (Public Law 96-335) was passed in 1980. It focused mainly on sand deposition problems in the heavily logged Grass Valley Creek watershed, a tributary of the Trinity River. This led to construction of the Buckhorn Debris Dam and sediment collection pools in Grass Valley Creek, and the purchase of 17,000 acres of highly erodible land in the Grass Valley Watershed (congress.gov). In March 1982, the Fish and Wildlife Task Force completed its long-range plan, the Trinity River Basin Fish and Wildlife Management Program, which identified eleven actions for restoring fish and wildlife habitat. In 1984 Congress passed the Trinity River Basin Fish and Wildlife Management Act (Public Law 98-541), which directed the Secretary of the Interior to formulate and implement a program to restore the fish and wildlife populations of the Trinity River Basin to pre-dam levels, with assistance from the Task Force and its management program. The law officially "established" the Task Force by listing its members; the California Department of Forestry was added to the original 13. The Act appropriated $33 million for design and construction and $24 million for operations, maintenance, and monitoring over 10 years (1985-1995). 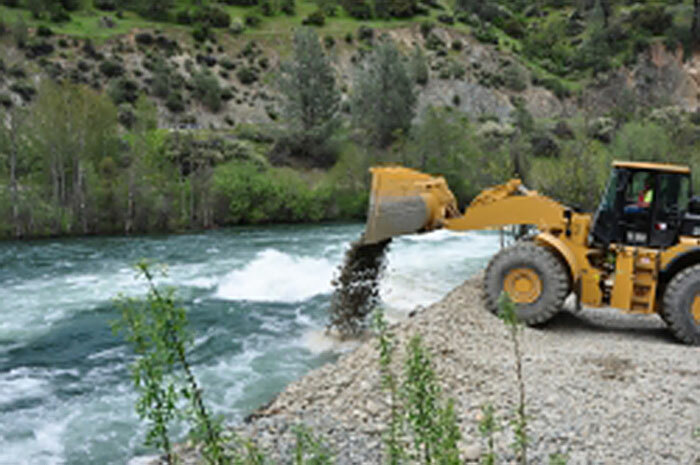 Restoration efforts included modernizing Lewiston Hatchery and initiating various habitat restoration efforts such as replacing spawning gravel, reestablishing meander channels, dredging deep pools in the river, and feather-tapering the river's edges. In 1995 the Act was reauthorized for 3 more years, and five members were added to the Task Force: the Yurok and Karuk Tribes, commercial and recreational fishing interests, and the timber industry (DOI 2000, congress.gov). Besides increased streamflow, it was found that a reconfigured channel and a strategy for sediment management were necessary to provide for diverse habitat requirements, such as spawning gravels for adults and calm, sheltered areas for juveniles. An environmental impact statement to evaluate the range of alternatives to restore the natural production of anadromous fish in the Trinity River was completed in October 2000 (USFW et al. 2000). In a December 2000 Record of Decision, the Department of the Interior decided to adopt the EIS's "preferred alternative" as well as its implementation plan. According to BOR and HVT (n.d.), "This strategy does not strive to recreate pre-dam conditions; rather, the goal is to create a smaller, dynamic alluvial channel exhibiting all the characteristics of the pre-dam river but at a smaller scale." Populations of chinook, coho, and steelhead were expected to be about eight times greater than the estimate for the "no action alternative" and to ultimately result in self-sustaining anadromous fish populations in the Trinity River (DOI 2000). An adaptive environmental assessment and management program (DOI 2000). The implementation timeline is shown in Figure 5. Source: BOR and HVT n.d.
Central Valley Project water and power users immediately filed suit to prevent implementation of the 2000 Record of Decision. Court rulings and appeals in 2001, 2002, and 2003 changed the required instream flows up and down, but a final ruling in 2004 essentially left them the same (TRRP n.d.1). The TRRP formed the Trinity Management Council to provide overall program direction and the Trinity River Adaptive Management Working Group to apply a systematic strategy of monitoring and adaptive management, allowing management to evolve as new information becomes available. In addition a number of smaller teams and work groups were established: Design Team, Fish Work Group, Flow Work Group, Gravel Work Group, Interdisciplinary Team, Watershed Work Group, and Wildlife and Riparian Work Group (trrp.net). Each year the TRRP creates a Restoration Flow Release Schedule based on preliminary water year forecasts in February and March. 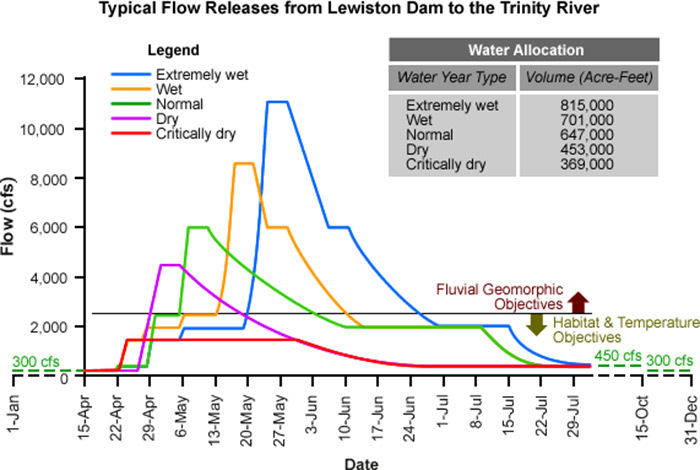 A complex schedule of optimum releases from Lewiston Dam is required to achieve habitat and temperature objectives as well as geomorphic objectives. Figure 6 shows typical flow releases for various water year types. The flow is 300-400 cubic feet per second from August to April, but increases dramatically in the summer. Work on the various channel rehabilitation, sediment management, watershed restoration, and infrastructure improvement projects began in 2004, and by 2013 over half of the rehabilitation projects prescribed by the Record of Decision had been completed (Dunklin 2013). In 1986 Congress passed the "Klamath Act" (Public Law 99-552) to provide for the restoration of the fishery resources in the Klamath River Basin. It was reasoned that the Secretary of the Interior had authority to implement an anadromous fish restoration program only in the Trinity River, and additional authority was needed for the Klamath River. The Secretary was to "designate the anadromous fish habitats and resources of the Klamath River basin as the Klamath River Basin Conservation Area" and to develop a 20-year restoration program. In practice, the area includes five sub-basins north of the Trinity River basin, between the coast and Iron Gate dam (see Figure 8). The law established an 11-member Fishery Management Council and 12-member Fisheries Task Force; $21 million was appropriated for the period 1986 to 2006, provided that at least half the expenditures come from non-federal sources. KFMC's primary mission was to make recommendations on regulations for in-river and ocean harvesting to six agencies: the California Fish and Game Commission, the Oregon Department of Fish and Wildlife, the Pacific Fishery Management Council, the Bureau of Indian Affairs, the Hoopa Valley Tribal Council, and the Yurok Interim Council. In devising its long-term plan, the KFMC adopted the interactive planning and management system in place at the Southwest Region of the National Marine Fisheries Service in La Jolla, California. First, each Council member identified important issues from his or her perspective. The 60 issues identified were narrowed down to 31 most important ones, and those were divided into "fundamental" and "symptomatic" issues. Fundamental issues were to be addressed first, as this can often solve symptomatic ones. A flow chart was developed of the issues and their relationships. Then goals and objectives were developed for the KFMC harvest management system, along with their relationships. A long list of options for attaining the goals was created, pros and cons of each were debated, and the list was narrowed down by majority vote. This led to a list of 37 tasks, grouped into nine categories: decision making process, harvest management strategies, resource assessment and monitoring, organizational approach, communication, escapement policy, habitat, allocation strategies, and stock enhancement (KFMC 1992). The Council decided to focus on chinook, as "no reliable estimates" were available for coho, steelhead, sturgeon, lamprey, candlefish, or shad (KFMC 1992). It adopted the principle of maximum sustained yield and a model developed by its Technical Advisory Team. In 1987, KFMC arrived at a "Klamath River Salmon Management Long-Term Harvest Sharing Agreement" for fall chinook which established a maximum annual harvest of 65% per brood (year born) and an annual escapement (not caught) floor of 35,000 naturally spawning adults (KFMC 1992). The KFMC meets three times each spring to review the past year's harvest of Chinook salmon, and to review predictions of Chinook salmon ocean abundance and harvests in the upcoming year developed by their Technical Advisory Team. The KFMC then makes specific recommendations to the agencies that regulate the harvest of Klamath Basin fish. … KFMC recommendations to the Pacific Fishery Management Council are used to develop ocean salmon fishing seasons. The Pacific Fishery Management Council then passes its recommended fishing seasons to the Department of Commerce, which has final authority in setting regulations for the ocean fishery. The KFMC also holds a fall meeting. At that meeting members hear the results of scientific studies, and discuss ways of improving management. They address issues such as hatchery practices, fishery monitoring, salmon sub-stocks, endangered species listings and harvest allocation. The public is invited to attend all KFMC meetings, and public comment periods are scheduled throughout the meeting agenda (Yreka Fish and Wildlife Office 2008a). According to the Klamath Act, the Task Force includes representatives of the same entities as the Council, but minus four (offshore recreational fishing, non-Hoopa Indians, Pacific Fishery Management Council, commercial salmon fishers of Oregon) and plus five (the U.S. Department of Agriculture and the counties of Del Norte, Humboldt, Siskiyou, and Trinity). In 1988 the Karuk and Yurok tribal representatives were added. Two additional members from the Upper Klamath Basin were added later. It was suggested that nine more members would be needed to represent all the interests—e.g., timber, mining, agriculture—but that was thought to be too unwieldy (KRBFTF 1991, 2006). The main function of the Task Force was to assist the Secretary of the Interior in formulating, coordinating, and implementing the 20-year restoration program. To formulate its long-range plan (KRBFTF 1991), the Task Force enlisted the help of William M. Kier Associates. The 403-page plan provides a great deal of historical information as well as detailed data on various stock groups. With the goal of preventing the need for Endangered Species Act action, the plan identified priority stock groups in each of five sub-basins, as well as habitat problems that were impeding recovery at each location (see Table 1). The long-range Restoration Program plan suggests over 200 detailed actions for: (1) habitat protection and management--including land management such as timber harvesting, mining, and agriculture, as well as water management such as power projects and stream diversions; (2) habitat restoration; (3) fish population protection; (4) fish population restoration (e.g., small-scale hatcheries); (5) education and communication; and (6) program administration. The Task Force encouraged the development of local watershed groups for each sub-basin to create detailed restoration plans. The groups included: Shasta River Coordinated Resource Management Planning Group, Scott River Watershed Council, Salmon River Restoration Council, Karuk Tribe of California, Mid-Klamath Watershed Council, and the Yurok Tribe (KRBFTF 2006). "While volunteer effort lends the obvious advantage of enabling projects at low cost, it serves even more importantly to create a grass-roots, or community-level, commitment to fish conservation" (KRBFTF 1991, p. 3-3). Moreover, these groups were able to leverage funds far beyond what Congress had appropriated (KRBFTF 2006). Each spring the Task Force issued a Request for Proposals through the Yreka Fish and Wildlife Office. The Task Force's Technical Work Group ranked the proposals on their technical merit, and each June the Task Force decided which projects would be funded in the next fiscal year. In the 20 years 1986-2006, the Restoration Program funded over 300 projects for a total of about $11.2 million. They included 10 projects for upland restoration, 8 water conservation and water quality projects, 20 small-scale hatchery and rearing projects, 20 instream habitat improvements, 26 riparian restoration projects, 164 assessment and monitoring projects, and 47 education projects. An additional $7.5 million was spent on management and administration (Yreka Fish and Wildlife Office 2008b, KRBFTF 2006). The program was not reauthorized by Congress in 2006, but many of the watershed projects financed with non-federal funds are ongoing. While things were improving in the lower and middle Klamath basin, nothing changed in the upper basin. The water rights Adjudication and the many court cases involving Indian tribes, farmers, ranchers, fishermen, environmentalists, and government agencies created an atmosphere of animosity, and the stakeholders communicated mainly through their lawyers. The drought of 2001 brought the conflicts to the forefront. Very low water levels in Upper Klamath Lake forced the Bureau of Reclamation to cut off water to farmers mid-season to protect the endangered sucker fish. Almost 200,000 acres of crops were left to wither and die. This galvanized the farmers; they held protests, sued the federal government for "taking," and demanded a new scientific study (Leslie 2014, klamathrestoration.org, FFA 2016, Souza 2004). President Bush happened to be in the area at the time, and promised to help both the farmers and the fish. He established a Klamath Basin cabinet-level working group and $260 million was allocated for 2003-2005 (Keppen 2004). In 2002, water was restored to the farmers. "Secretary of the Interior Gale Norton personally opened the headgates, restarting the traditional diversion of some 450,000 acre-feet per year into the canals" (Symmes 2003). But that September saw the biggest adult salmon die-off in the history of the American West. Over 33,000 adult salmon died; some estimates are as high as 69,000 (see Figure 10). (Many more juvenile salmon had died that spring, but it was less obvious (Bacher 2002).) The die-off was primarily due to the gill parasite Ichthyopthirius multifilis, but low flow, high water temperatures, and algae were contributing factors (Leslie 2014, FFA 2016, klamathrestoration.org, FERC 2006). According to a study by the Yurok Tribal Fisheries Program (2004), "Had the flow from Iron Gate Dam in August and September been at or above approximately 1000 cfs, as they were in all other years of above average escapements, it is likely that the fish kill would not have occurred." The fish kill galvanized the Indian tribes, fishermen, and conservationists. In October the Yurok and Hoopa Valley tribes sent 500 pounds of rotting salmon to the Department of the Interior in Washington, DC. "The Bureau of Reclamation suddenly discovered that it had spare water to flush out the river, and an estimated 65,000 salmon surged upstream" (Symmes 2003). Commercial fishermen and environmental groups filed a lawsuit challenging the Bureau of Reclamation's new 10-year plan for the Klamath Project (Bacher 2002). A group of Indians, fishermen, and conservationists travelled to PacifiCorp headquarters in Glasgow, Scotland to demand removal of the company's dams from the Klamath River (Craig Tucker, interview 8/30/16). The Klamath River Basin Federal Working Group created by President Bush (comprised of the Secretaries of Interior, Agriculture, and Commerce, and the Chairman of the Council on Environmental Quality) invested in a number of projects for habitat restoration and water conservation during 2003-2005, including removal of Chiloquin Dam from the Sprague River and increased funding for the Natural Resources Conservation Service (Souza 2004). PacifiCorp's license for the Klamath Hydroelectric Project dams was due to expire in 2006, and in 2004 the company filed an application for renewal with the Federal Energy Regulatory Commission (FERC). It proposed various improvements for water quality and fish passage, but after receiving comments from government agencies, Indian tribes, and other interested parties, FERC imposed 25 additional environmental measures (FERC 2006). This would have caused the Klamath Hydroelectric Project to operate at a net annual loss, and dam removal became a realistic alternative (DOI 2013). According to FFA (2016, p. 20), "a number of people came to the conclusion that things were so bad that there had to be a better way. The protests and litigation created a lot of heat and cost time and money, but had not produced more water or more fish." Moreover, lawyers for the Klamath Project farmers realized they would not prevail in the Adjudication, and they would be better off with an out-of-court settlement agreement (Ed Sheets, interview 7/13/16). Leaders for the tribes and irrigation districts started talking to each other and seeking common ground. The tribes wanted their fishing restored, but did not want to put their neighbors out of business. The farmers and ranchers needed water, but also wanted the fish to survive. The parties realized that any agreement would need support from all of the key interests in the basin. Most of these interests were already participating in the Federal Energy Regulatory Commission relicensing process for the PacifiCorp dams. As various groups discussed what to do with the dams they also identified other actions that were needed to restore fisheries and provide more certainty for irrigators (FFA 2016, p. 21). They found they had enough common ground to form the Klamath Settlement Group in 2005 (Ed Sheets, interview 8/30/16). The 26-member group included federal, state, and county agencies, Indian tribes, irrigators, fishermen, and environmental organizations. High-level commitment was key in moving the process forward: the U.S. Secretary of the Interior at the time, Dirk Kempthorne, was formerly the Governor of Idaho. He had participated in a successful effort to craft a water settlement for the Snake River and wanted to replicate that experience. The Governors of California and Oregon also saw it as a high priority. "That translates into assigning good people, making sure that had the right technical and legal expertise, and also the push to get something done" (Sheets 2011b, Ed Sheets interview 7/13/16). Mitigation for counties that may be affected by the settlement (Klamath Settlement Group 2007). You let people talk for a while and you can say something like "I think what I'm hearing" and you try to synthesize the common themes you may have heard from both sides or all the sides and people say "Yeah, maybe we are kind of agreeing on that, and let's see if we can't get some people together to write that out. … After a while you might get one of the parties to say "I might be willing to do this if other people were willing to do that." When you start to see some of that discussion going, you can start to say OK, here's the element of a deal that could come together (Ed Sheets, interview 7/13/16). Much of the work was delegated to small groups to work through each issue. There were more than 570 drafting committee and other small group meetings and conference calls to prepare specific provisions or resolve issues; some of these calls involved a few people for an hour or two, most involved 10 to 25 people for three or four hours, a number of drafting committee calls had more than 25 people and lasted six to eight hours (Sheets 2011b). Besides scheduling and chairing these meetings and conference calls, Sheets helped the parties find acceptable wording for areas of agreement. He kept the process moving along by identifying and tracking follow-up actions needed. The negotiations developed some creative win-win solutions but also many compromises where none of the parties got everything they wanted (Sheets 2011b). The Klamath settlement organizations produced two separate but related agreements in February 2010: the Klamath Basin Restoration Agreement (KBRA) and the Klamath Hydroelectric Settlement Agreement (KHSA). The parties were to sign the agreements concurrently, as dam removals prescribed in the KHSA was necessary for the projects described in the KBRA. Federal agencies did not sign the KBRA because that would require enabling legislation, but they did sign the KHSA. The basic elements of the Klamath Basin Restoration Agreement (KBRA) are a fisheries program, a water resources program, and an economic program. The fisheries program includes restoration, reintroduction, and monitoring. For restoration, besides supporting the removal of PacifiCorp's four lower dams, the parties agreed to work on other conditions harmful to fish—e.g., degraded riparian habitat, poor water quality, fluctuating water levels, and agricultural diversions that trap fish. For reintroduction, the Oregon Fish and Wildlife Commission adopted a policy to work with the Klamath Tribes and other fish managers to establish populations of chinook, steelhead, coho, and lamprey above Upper Klamath Lake. A variety of release and rearing strategies were to be used to optimize opportunities for success. Reintroduction measures below Upper Klamath Lake and in California would be decided depending on how much natural re-colonization occurred. The Bureau of Reclamation agreed to research appropriate methods and locations for screens to prevent fish from entering irrigation diversions. Monitoring was to be designed to inform adaptive management. The federal Fish & Wildlife Service and National Marine Fisheries Service were to lead the effort to develop a plan. State fish managers would seek comments and recommendations from the other KBRA parties and the public to help develop the monitoring plan (KBRA 2010). The water resources program attempted to balance increased streamflow with assurances to current water users. It included (i) an On-Project Water Users Program, (ii) an Off-Project Water Program; (iii) a Power for Water Management Program; (iv) Additional Water Conservation and Storage; (v) Drought, Climate Change, and Emergency; and (vi) Environmental Water. Limitations on diversion for irrigation and wildlife refuges are detailed in Attachment A. Depending on the annual March 1 Natural Resources Conservation Service forecast, allowable diversions are specified for in the periods March-October and November-February. The U.S. Fish and Wildlife Service and the irrigation districts filed a stipulation in the Klamath Adjudication giving very precise details on how this will be achieved (Appendix E-1 to KBRA). "The Department of the Interior and the Yurok Tribe have estimated that the limitation will result in the availability of water for irrigation being approximately 100,000 acre feet less than current demand in the driest years, with irrigation water availability increasing on a sliding scale with increasingly wet conditions" (Sheets 2011a). Once the dams are removed and additional storage is created, the allowable diversions will increase by an average of 10,000 acre-feet. The Klamath Water and Power Agency is responsible for overall oversight of the on-project plan. The off-project water program includes a voluntary water use retirement component, with a fund administered by the U.S. Fish & Wildlife Service. This is expected to reduce demand by 30,000 acre-feet per year. The Drought Plan was to be developed by a group including Klamath Tribes, Karuk Tribe and Yurok Tribe, Upper Klamath Water Users Association, the Klamath Water and Power Agency, the Klamath Basin National Wildlife Refuges, Oregon Water Resources Department, California Department of Fish and Game, and one additional Party. The Klamath Drought Fund is to be administered by the National Fish and Wildlife Foundation. The economic program includes funds for Klamath, Siskiyou, Humboldt, and Del Norte counties for any costs associated with KBRA and KHSA. It also includes a tribal program that (a) helps fund participation in the activities associated with the fisheries and water resources programs and (b) funding for long-term economic revitalization projects, including acquisition of the Mazama Forest Project in Klamath County, Oregon and an interim fishing site just below Iron Gate Dam (KBRA 2010). In exchange, the tribes relinquish all claims against the United States as well as various claims in the Klamath Basin Adjudication. "The agreement settles long standing water rights disputes between Klamath Tribes and the Irrigation Project in order to provide both communities with greater certainty and economic stability." But the tribes' agreement to relinquish their claims against the United States, and to not litigate for more water than the KBRA provides, will become permanent only if: farmers follow the agreed upon limits on diversions; endangered species are recovering; the United States fully funds the fisheries reintroduction plan; and all four dams are removed (klamathrestoration.org). The budget for all the commitments, according to the implementation schedule, is shown in Table 2. The total is over $970.4 million. This was revised down to $798.5 million in 2011. Actual new federal expenditures were estimated at $250 million. The Klamath Hydroelectric Settlement Agreement (KHSA) lays out the process for studies, environmental review, and a determination by the Secretary of the Interior on whether the removal of four PacifiCorp dams (Iron Gate, J.C. Boyle, Copco 1 and Copco 2) from the Klamath River (a) will advance restoration of the salmonid fisheries of the Klamath Basin; and (b) is in the public interest. Assuming the answer is yes, the KHSA describes interim operations and a process for the transfer of ownership to a dam removal entity for decommissioning and removal of the dams. Dam removal is slated for 2020. PacifiCorp agrees that its water rights will be converted to instream flows, and the company is protected from any liability associated with dam removal. Dam removal is expected to cost around $450 million, with PacifiCorp customers contributing $200 million through a surcharge on electricity, and California contributing $250 million through its taxpayer-funded water bond (Ed Sheets 2011a, KHSA 2010). The KHSA also has a "Community Power" component under which "PacifiCorp and the irrigation-related Parties will in good faith cooperate in the investigation or consideration of joint development and ownership of renewable generation resources," and the parties agree to support the federal designation of Siskiyou County and Klamath County as Western Renewable Energy Zones (KHSA 2010). In addition, the KHSA calls for transfer of title to Keno Dam from PacifiCorp to the Department of the Interior. "The agreements were lauded by supporters as providing a path to restore hundreds of miles of fish habitat and end decades of water rights disputes between tribes and irrigators" (Houston 2016). The Secretary of the Interior immediately set to work on preparations for a Secretarial Determination and environmental impact statement for the dam removal described in KHSA (see klamathrestoration.gov). Also in 2010, the Oregon and California public utilities commissions approved PacifiCorp's surcharge to pay for decommissioning the four hydroelectric dams (klamathcouncil.org). Federal legislation to implement the KBRA and KHSA was introduced in 2011 as the Klamath Basin Economic Restoration Act, but no action was taken. After 38 years of deliberation, on March 7, 2013 the Oregon Water Resources Department issued a Final Order of Determination in the Klamath River Basin Adjudication that had begun in 1975. It awarded the river's senior rights to the Klamath Tribes because—although Bureau of Reclamation rights date back to 1905 and some upper basin ranchers' rights date back as far as 1864—Indian rights are from "time immemorial." "Just two months later, concerned by the impact of a long-running drought on Klamath fish, the tribes exercised their newly-enforceable rights. For the first time since ranchers began settling the basin in the late nineteenth century, their water was cut off," leaving over 100,000 cattle without water. The upper basin ranchers, who had refused to participate in settlement negotiations, suddenly realized that their livelihoods depended on making a deal. Negotiations among the tribes, ranchers, and federal and Oregon government officials lasted eight months and resulted in the Upper Klamath Basin Comprehensive Agreement (UKBCA), signed on April 18, 2014 (klamathrestoration.org, Leslie 2014). The UKBCA has three components: Economic Development, Water Use Program, and Riparian Program. Payment of $1 million annually from the Department of the Interior to the Tribes, for a period of five years, to address Tribal needs during the Transition Period beginning in 2014. The water use program--administered by a "joint management entity" and a "landowner entity"--requires ranchers and farmers in the upper basin to reduce water withdrawals enough to increase flows into Upper Klamath Lake by 30,000 acre-feet by 2019. "Call thresholds" at various locations were established as water levels below which the tribes could assert their senior water rights. The primary means for reducing water use is the permanent retirement of water rights. Additional tools for reducing net consumptive use are: leasing, efficiency measures, agreements to rotate the use of water, storage and release, and improved land management. The riparian program aims to improve stream-side vegetation, thereby improving and maintaining water quality and fish habitat. Riparian landowners enroll in the program and develop site-specific Riparian Management Agreements (UKBCA 2014). Signatory parties included the Governor of Oregon, the Klamath Tribes, Oregon Water Resources Department, Resource Conservancy and Sprague River Water Resource Foundation, Fort Klamath Critical Habitat Landowners, Upper Klamath Water Users Association, and a number of individuals (UKBCA 2014). Again, federal agencies could not sign without enabling legislation. As of December 2015, the parties had formed a Joint Management Entity and Landowner Entity, and reduced water use by 5,278 acre-feet. Irrigators have been cooperating among themselves to rotate water use so that the monthly flow levels are met. For the riparian program, letters of interest from landowners representing 66% of the eligible river bank miles of habitat had been secured. (The interim targets were 5,000 acre-feet and 50%, respectively) (KBCC 2015). In May 2014 and January 2015 federal legislation to implement all three agreements—KBRA, KHSA, and UKBCA—was introduced, but failed to pass Congress. On December 31, 2015 the KBRA expired due to this lack of implementing legislation. The KHSA and UKBCA do not have the same expiration date, but also require Congressional approval. Thus none of the above has been implemented. However, the Bureau of Reclamation now subtracts water for endangered coho and sucker fish before making its allocation to the Klamath Project irrigators (BOR 2016). The KHSA does not rely on federal funding, and to circumvent the requirement for Congressional approval, "the States of Oregon and California, PacifiCorp and the federal government – through the U.S. Departments of the Interior and Commerce – announced an agreement-in-principle to move forward with amending the Klamath Hydroelectric Settlement Agreement (KHSA)." "The parties to the KHSA will pursue its implementation through the administrative process governed by the Federal Energy Regulatory Commission (FERC)" ("Parties agree to new path" 2016). The revised KHSA was signed on April 6, 2016 by the Governors of California and Oregon and the U.S. Secretary of the Interior (Figure 11). They were joined by "several other state, federal, power, irrigator and environmental officials," as well as PacifiCorp. The target date for dam removal remains 2020. The new agreement requires PacifiCorp to transfer ownership of the dams to the newly created non-profit, Klamath River Renewal Corporation. The non-profit will then submit an application to FERC to remove the dams. Secretary of the Interior Sally Jewell "said that the scientifically proven benefits of dam removal combined with the economic infeasibility of PacifiCorp constructing required fish-friendly upgrades to its dams, such as fish ladders, makes her confident that the application will pass through the commission" (Houston 2016). Figure 11. On April 6, 2016 California Gov. 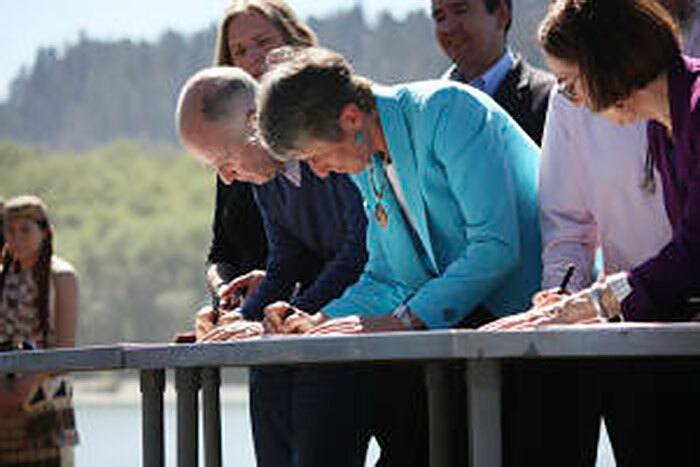 Jerry Brown, U.S. Secretary of the Interior Sally Jewell, and Oregon Gov. Kate Brown sign the new Klamath Hydroelectric Settlement Agreement as Yurok women look on. In June 2016, FERC granted PacifiCorp's request to suspend its relicensing proceedings. In September, PacifiCorp and the Klamath River Renewal Corporation filed a joint application for approval of license amendment and transfer, and the Klamath River Renewal Corporation asked FERC to approve dam decommissioning and removal. The next step is public hearings and it is hoped FERC will make its decision by December 31, 2017 (klamathrenewal.org). Table 3 summarizes the process of Klamath restoration efforts. Stakeholders can be self-organizing, or appointed by legislation. The Trinity River Restoration Program shows that the strategy of starting with a prescribed list of projects, which can be modified by adaptive management, works well. The mid-basin fish restoration program shows that the strategy of allowing local watershed groups to propose their own projects also works well. The Klamath Settlement Agreements show that it is not a good strategy to allow federal negotiators to participate in agreements for which they have no authority to sign or deliver the bargained-for benefits. Even Cabinet-level support does not guarantee success in Congress. In terms of sheer efficiency, President Bush's short-lived (2002-2005) Klamath River Basin Federal Working Group was exemplary. It (a) created a single working group of just four Cabinet-level members, including the Department of Agriculture, which was missing from most other restoration efforts; (b) allocated ample funding without needing approval from Congress; (c) used most of the money on existing programs, such as the Fish & Wildlife Service and the Natural Resources Conservation Service, instead of creating new ones. Every EcoTipping Points story has a negative tip and feedback loop that is countered by a positive tip and feedback loop. In this case, the negative tip and feedback loop include factors mentioned in the history: dams, logging, mining, and overfishing all contributed to the degradation of the ecosystem. The positive tip and feedback loop is the restoration projects that seek to reverse the damage. 1. Outside stimulation and facilitation – An Eco Tipping point story typically begins when people or information from outside a community bring on a shared awareness about a problem. The federal government features prominently as an outside stimulator—especially the Department of the Interior, which includes the Bureau of Reclamation, Bureau of Indian Affairs, Bureau of Land Management, and the U.S. Fish and Wildlife Service. In the Klamath Settlement Agreements, drought was a catalyst for action, and an outside facilitator was hired to move the process along. 2. Strong democratic local institutions and enduring commitment of local leadership – The community moves forward with its own decisions…everyone feels a sense of ownership. The many councils and task forces and working groups exemplify collaboration and shared commitment. 3. Coadaptation between social system and ecosystem – Social system and ecosystem fit together, functioning as a sustainable whole. When one gains, so does the other. Ecosystem restoration helps to balance social interests and restore abundance. 4. Letting nature do the work – Eco Tipping Points create the condition for an ecosystem to restore itself by drawing on nature's healing powers. Watershed rehabilitation creates the conditions for plants and fish to regenerate. Dam removal is expected to solve many additional problems, such as water quality. While anadromous fish cannot be expected to swim up past their place of birth, proposed upstream reintroduction plans can lead to a self-sustaining fish population. 5. Rapid results – Quick "payback" and something that can stand as a symbol of success help communities stay committed to change. Increased streamflow is a sign that recovery is underway. 6. A powerful symbol – Something that serves as inspiration or stands for success in a way that helps communities stay committed to change. The salmon is most often used as an inspirational symbol. 7. Overcoming social obstacles – Overcoming social, political, and economic obstacles that could block positive change. Stakeholders had to overcome their disagreements as well as bureaucratic and financial hurdles. 8. Social and ecological diversity – Diversity of people, ideas, experiences, and natural elements provide more choices and opportunities, with better chances that some of the choices will be good. The diversity of stakeholders with differing views and expertise, as well as a variety of strategies for ecosystem rehabilitation, increased the chances of success. 9. Social and ecological memory – Learning from the past adds to the diversity and often points to choices that were once sustainable. Nature has some of this memory built in. People and fish both remember a time when there was an abundance of aquatic life in the river. 10. Building resilience – "Locking in" sustainability by creating the ability to adapt and deal with new (and often unexpected) conditions that threaten sustainability. Some projects are continuing although federal funding ran out. Dam removal is moving forward although Congress failed to approve other parts of the Klamath Settlement Agreements. Bacher, Dan. 2002. Fishermen File Suit Against Klamath Ten Year Plan. Dissident Voice. BLM (U.S. Bureau of Land Management). 1995. Mainstem Trinity River Watershed Analysis. Redding, CA: BLM. BOR (U.S. Bureau of Reclamation). 2009. Klamath Project. BOR (U.S. Bureau of Reclamation). 2016. Reclamation Releases 2016 Klamath Project Water Allocation and Operations Plan. BOR (U.S. Bureau of Reclamation) and HVT (Hoopa Valley Tribe Fisheries Department). n.d. Trinity River Restoration Program: Summary of the United States Secretary of the Interior Record of Decision, December 19, 2000. Boyle, John C. n.d. FISH (and Hatcheries). Denton, H. 1982. Speech to Klamath-Trinity River Salmon Restoration Advisory Committee, October 22, 1982. Eureka, CA. DOI (U.S. Department of the Interior). 2000. Record of Decision, Trinity River Mainstem Fishery Restoration Final Environmental Impact Statement/Environmental Impact Report. Dunklin, Thomas B. 2013. TRRP Overview - Restoring - Adapting – Improving. Video. EPA (U.S. Environmental Protection Agency). n.d. Watershed Priorities: Klamath River Basin, California & Oregon. FERC (Federal Energy Regulatory Commission). 2006. Draft Environmental Impact Statement for the Klamath Hydroelectric Project, Docket No. P-2082-027, Executive Summary. FFA (Family Farm Alliance). 2016. Western Farmers and Ranchers as Problem Solvers. Report prepared for the White House Water Summit, March 22, Washington, DC. Houston, Will. 2016. Klamath River dam removal deal signed by top federal, state officials. Eureka Times-Standard, April 7. KBCC (Klamath Basin Coordinating Council). 2015. Fifth Annual Report. KBRA (Klamath Basin Restoration Agreement for the Sustainability of Public and Trust Resources and Affected Communities). 2010. Keppen, Dan. 2004. The Klamath Project at 100: Conserving our Resources, Preserving our Heritage. Klamath Falls, OR: Klamath Water Users Association. KFMC (Klamath Fishery Management Council). 1992. The Klamath Fishery Management Council Long-term Plan for Management of Harvest of Anadromous Fish Populations of the Klamath River Basin. Yreka, CA: KFMC. 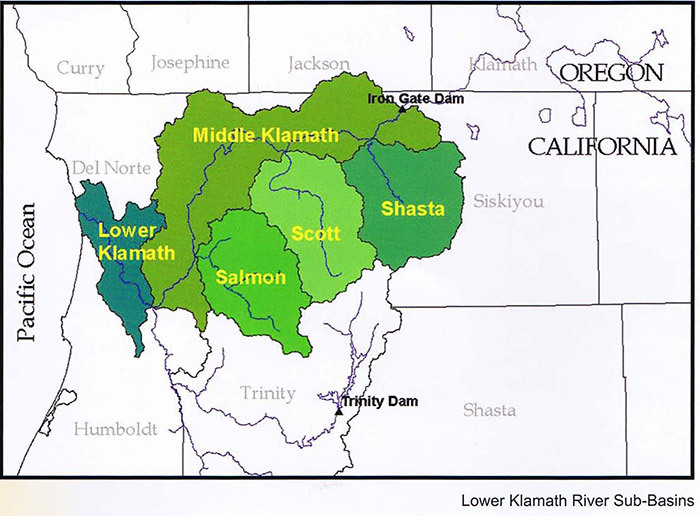 KHSA (Klamath Hydroelectric Settlement Agreement). 2010. Klamath-Salmon Media Collaborative. 2007a. Solving the Klamath Crisis: Keeping Farms and Fish Alive, Part 1. Video. Klamath-Salmon Media Collaborative. 2007b. Solving the Klamath Crisis: Keeping Farms and Fish Alive, Part 2. Video. Klamath Settlement Group. 2007. The Best Hope for Solving the Klamath River Crisis. Klamath Tribes. n.d. Klamath Tribes History. KRBFTF (Klamath River Basin Fisheries Task Force). 1991. Long Range Plan For The Klamath River Basin Conservation Area Fishery Restoration Program. Yreka, CA: U.S. Fish and Wildlife Service, Klamath River Fishery Resource Office. KRBFTF (Klamath River Basin Fisheries Task Force). 2006. 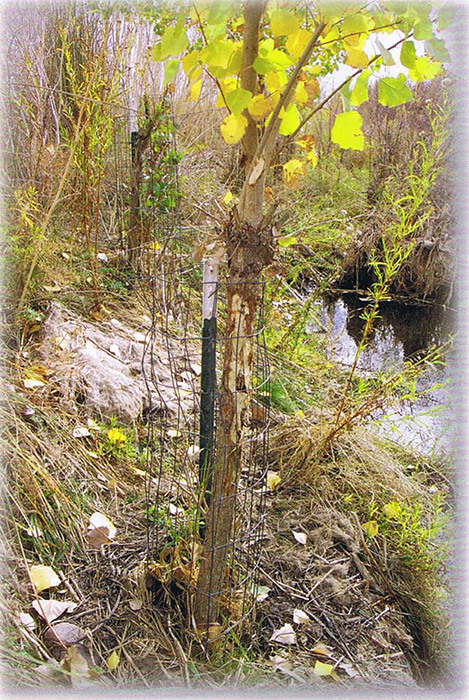 Klamath River Basin Conservation Area Restoration Program Activities 1986-2006. Leslie, Jacques. 2014. Oregon's Klamath River Basin One Step Closer to Historic Dam Removal. Earth Island Journal, April 17. NBC News. 2009. Utility OKs Klamath dam removals, salmon aid. NMFS (National Marine Fisheries Service) and FWS (U.S. Fish and Wildlife Service). 2013. Biological Opinions on the Effects of Proposed Klamath Project Operations from May 31, 2013, through March 31, 2023, on Five Federally Listed Threatened and Endangered Species. NRCS (Natural Resources Conservation Service, U.S. Dept. of Agriculture). 2007 Klamath Basin Conservation Partnership Accomplishments. Sheets, Ed. 2011a. Summary of the Klamath Basin Settlement Agreements. Siskiyou County Board of Supervisors. 2016. Letter to Sec. Jewell and Gov. Brown regarding New Klamath Hydroelectric Settlement Agreement, April 5. Symmes, Patrick. 2003. River Impossible. Outside Magazine. TRRP (Trinity River Restoration Program). n.d.1 Legislative History. TRRP (Trinity River Restoration Program). n.d.2 Typical Releases. UKBCA (Upper Klamath Basin Comprehensive Agreement). 2014. USFWS (U.S. Fish and Wildlife Service) and HVT (Hoopa Valley Tribe). 1999. Trinity River flow evaluation final report. USFWS, Arcata, California and HVT, Hoopa, California. USFWS (U.S. Fish & Wildlife Service), USBR (U.S. Bureau of Reclamation), HVT (Hoopa Valley Tribe), and Trinity County. 2000. Trinity River Mainstem Fishery Restoration Environmental Impact Statement/Report. State Clearinghouse No. 1994123009. Yreka Fish and Wildlife Office. 2008a. Klamath Fishery Management Council. Yreka Fish and Wildlife Office. 2008b. Klamath River Basin Fisheries Task Force. Yurok Tribal Fisheries Program. 2004. 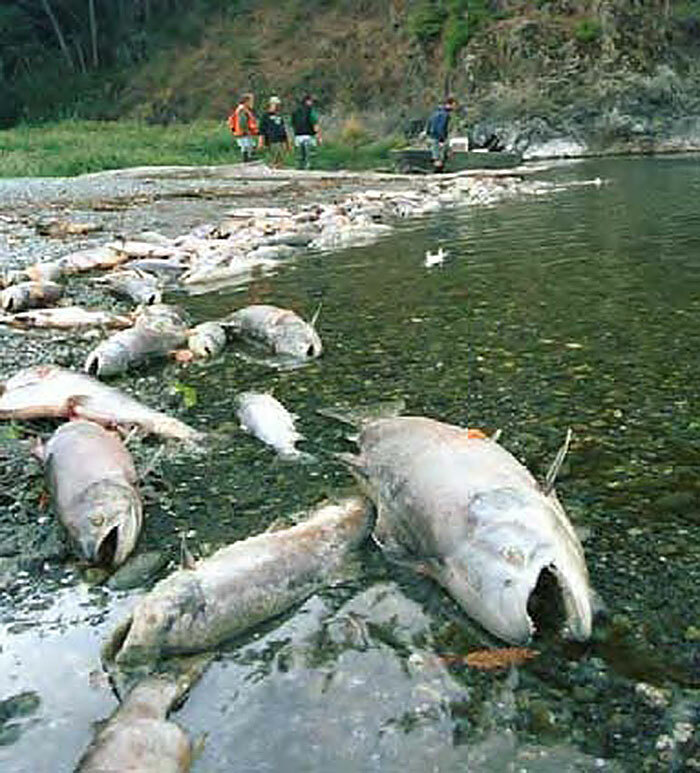 The Klamath River Fish Kill of 2002; Analysis of Contributing Factors.